One of China's most beautiful secrets, the Nine Villages Valley is a natural wonderland, stumbled upon by a lumberjack in 1972. Jiuzhai Valley is a beautiful national park with stunning coloured lakes, waterfalls and woodland. The valley is in a Y shape accessible on foot or by the hop-on / hop-off green buses. The entrance is 200RMB per day + 80RMB for a bus pass. Unfortunately, there is no 2 or 3 day pass so you have to pay the same every day (and queue for the ticket every day). We spent 3 days there so it was expensive (It could be seen in 2 long days). We trekked down pretty much all of the 3 legs of Y in the park except the left Zechawa route as the boardwalk down had been closed so the only route was the tarmac road which is windy and busy with buses. Many people just get on and off the frequent buses. The tourist centre in the centre of the Y has many restaurants and shops. The temple and Tibetan style village between the entrance and the centre are well worth a visit. 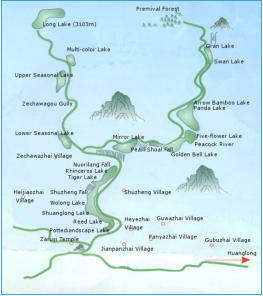 Best highlights to get off the bus and see at each valley: Rize Valley: Mirror Lake, Pearl Beach, Five Flowers Lake, Panda Lake, Arrow Bamboo Lake Zechawa Valley: Long Lake, Five-Coloured Lake Shuzheng Valley: Rhinoceros Lake, Tiger Lake, Reeds Lake, Nuorilang Waterfall, Shuzheng Waterfall, Shuzheng Lakes (or you can walk through this valley until you reach the exit if you have enough time). 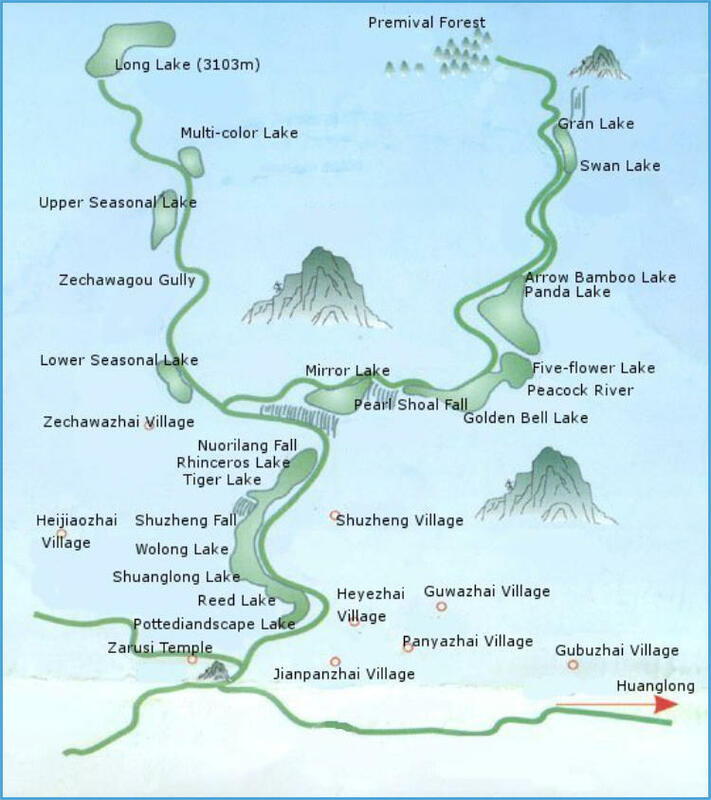 Our favourites: Panda Lake and waterfalls Named for allegedly being a favourite drinking spot of Giant Pandas, Panda Lake feeds the multi-level, multi-stream Panda Waterfalls, said to be the oldest in the valley. Pearl Shoals and Waterfall Atop the Pearl Waterfall are the Pearl Shoals, a broad expanse of rocks covered by brightly- coloured algae and plants. The water flows over a broad, rocky cliff, dropping from heights of up to 40 metres. Shu Zheng Lake and waterfall (with nearby watermill) A shallow lake surrounded by stunning scenery, with ancient fallen tree trunks and branches clearly visible in the water. Jiuzhaigou - Covering over 700 sq km of beautiful mountain valleys, the area contains nine traditional Tibetan villages (after which it is named) of which seven of the villages are still populated - as at 2003 there was a permanent population of around 1,000. Previously residents worked farms and fields, but now the focus is on tourism. Many of the residents are of the mountain-dwelling Qiang ethnic group, who carry on the old traditions for styles of clothing and hair. Settled in the 1300s by a group of Tibetan pilgrims who came to the area seeking refuge, the towering mountain range kept them, and the area, hidden for six centuries. Even today it is still wonderfully remote and pristine due to conservation efforts. Beneath the snow- capped peaks, the valley floors are dotted with turquoise, green and pink lakes – legend tells that they are the broken slivers of the Tibetan goddess Semo’s mirror, and rich, diverse forests. Some of the lakes have crystal clear waters through which you can see tree trunks, sunk to the lake bed in times gone by. The greens and blues of the lakes depend on the depth of the water and the concentration of different minerals in the water. The waterfalls often freeze in the winter.